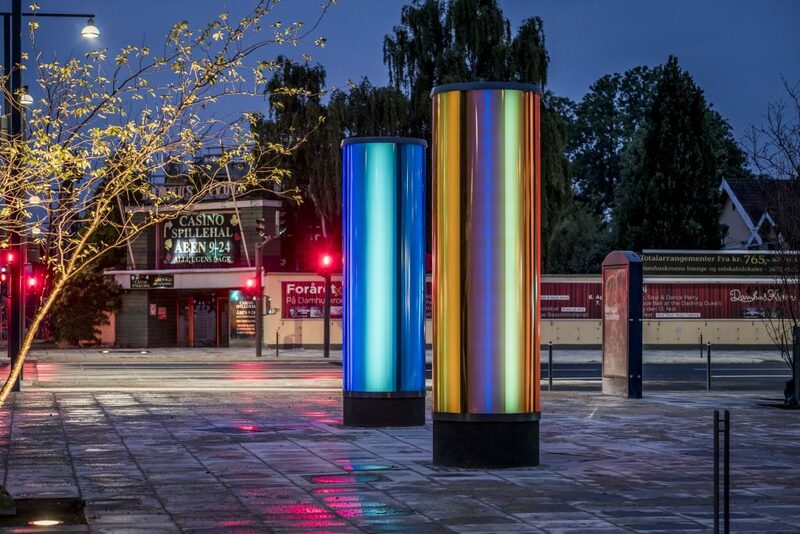 The art work “Gate of Colours” consists of two luminous columns, which together make up a modern city gate – which must welcome Rødovre Municipality. The work can be experienced in passing and from a longer distance as a new, luminous landmark for the area. And when you get closer to the sculptures, graduations are experienced between light and dark and between a colour nuance and another. The light work supports the interaction with and between people in its simple means and clear language, which lies in the sensation of the shift between colours and light intensities. The composition and the combination of coloured filters and the colours and shifts of the intangible light are the main components of the work. The sculptures have a slow dynamic, with intensity and colours changing softly and inviting. They appear as a quiet element on the square – as a contrast to the hectic Roskilde Road. The colour palette of the work is developed based on the colours of the context and with reference to the colours of the daylight. The colours are created through a double color matrix, where the colours of the sculpture foil blend in with the colours of the artificial light, thereby creating new colours. In the daylight, the physical colours of the work will be prominent and in the twilight, when the artificial light glows slowly, the bright colours and variations of the sculptures will be experienced against the twilight’s own colour palette. This creates an ever-changing colour composition between the changing colours of dusk, the darkness and the sculptures’ own artificial colours and dynamics. The sculptures shine from sunset to sunrise – all year round. Each column is 3.5 meters high incl. concrete base and 1 meter in diameter Colours of the columns are created by turquoise and orange foils respectively on specially made acrylic shells, diffusing foil and white and coloured LED lights. The light sculptures “Gate of Colours” were created by Christina Augustesen in collaboration with Sweco A / S and Lysiplex A / S. The work has been purchased by Rødovre Municipality and Rødovre Kunstråd, and the work has been created based on and specifically for the newly renovated Damhustorv. The work was inaugurated on June 21, 2018.